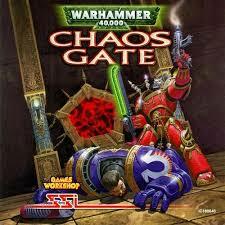 Warhammer 40000: Chaos Gate: The Revival! The rose tintedness of nostalgia! I used to own this venerable PC game many years ago and remember it fondly. Since then I have changed computers and operating systems many times and it’s never worked properly since. The crash occurrence which plagued this game was in retrospect pretty funny; if any chaos cultists got close enough to shoot you with their laser pistols the game would immediately crash to desktop. Given that most levels contained more cultists than you had ammo this made game continuity pretty tricky. I was digging through some old CDs and came across the Chaos Gate disc. I installed it, installed the patches and guess what? It freaking runs on Windows 7! The only change required was to run it in Windows 95 compatibility mode. It’s still the tense, suspenseful game of all those years ago. It could be described as the tactical section of the original XCOM Enemy Unknown/UFO Defense set in the world of Warhammer 40k with a linear RPG campaign element. Obviously the graphics are blocky by today’s standards but still functional. The soundtrack is still pretty great, with plenty of monk-esque chanting tunes to lead your Ultramarines into battle with the forces of Chaos. If you can get your hands on this game it’s well worth checking out for fans of the genre. After reading the first three novels in the Horus Heresy series I was feeling a bit unexcited with the prospect of reading the forth installment. Was this simply to be more bogwash lack of anything but cardboard characters speaking terse pompous lines against a backdrop of lots of shooty pew-pew; except this time it was to be in space? Was this to be basically a Battlefleet Gothic novel riding the vehicle of Horus’s lame conversion to the dark gods? The book was already sat on my desk so I set about the seemingly unenviable task of getting on with reading it. This was the first James Swallow novel I’ve ever read, and being a big Abnett fan I found the writing style a little foreign to begin with; but soon I was getting the hang of it. This is writing with big words from someone who obviously owns a thesaurus. 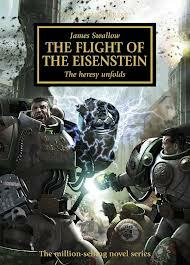 The book concerns the adventures of Battle-Captain Nathaniel Garro from before the Isstvaan campaign. The story initially is the same from the other books, but you see things from Garro’s perspective which makes for interesting reading. It adds meat to the bones of the books you have already read. The book is actually extremely well written and a really good read. The writing style adds much to heighten the tension. This time the characters are actually exciting and believable and the story itself is a real page turner at times. It’s a stellar achievement following the mediocrity of False Gods and the somewhat forgettable Galaxy In Flames. I’m off to get the next installment! TL;DR The best of the series so far by quite a margin! Way back in the primordial soup that was the nineteen eighties I started my gaming proper with Warhammer 40,000 eventually purchasing the 2nd edition box set when that came out. As cool as the Fantasy game seemed after a youth filled with Star Wars re-enactment with cardboard lightsabers I was very much a sci-fi child and 40k spoke to me in a much greater manner than the green fields of fantasy. Way back then I started out with Blood Angels but then, with the release of the Angels of Death Codex (gribblin still has a copy sitting on his bookshelf!) I switched to the secretive and clandestine Dark Angels. My 1500pts army consisted of Azrael, Asmodai, Ezekiel, a unit of Terminators, a lascannon and heavy bolter Predator, a Lascannon tarantula and a Vindicare Assassin. No, it didn’t win much actually! Eventually I sold off all my 40k collection and bought a copy of Warhammer Quest which I enjoyed immensely. I bought models here and there as I got older and tried to get a proper Fantasy army. However, no matter how many times I’ve tried to get away from it I’ve been unable to shake my love for 40k. People lament it as the dumbed down cousin to Warhammer proper, or a travesty of power creep at the hands of Mat Ward and his Codices of ultimate power. Despite all this I can never stay away for long and come crying back for more. There is a reason that a lot of the Internet refers to GW stuff as plastic crack. Like an addict I can try to clean myself up, but it is always easy to fall back into the welcoming embrace of stuff that is of debatable value and longevity. So what has prompted me to post a somewhat nostalgic look at the game that birthed my gaming dependence? 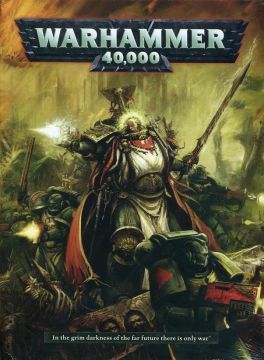 The new version of the 40k box set launches this weekend, it’ll be in two flavours as well, a limited edition version that gives you a Chaplain and the standard set that comes with a prodigious amount of models but no zealous spewer of the Imperial rhetoric. I’ve ordered mine from a local game store. This will be the first box I’ve bought like this since that fateful day in the early nineties. Currently all I have is my Dark Eldar, who I am honestly not that enthusiastic about in the new version of 40k. With a much heavier focus on shooting now my favourite Dark Eldar stuff has been reduced to anti-tank duty. Generally I’m a sucker for an aesthetic and I get very put off, very fast if I lose the momentum on something. Hence the Necrons codex sitting at home, I really like them. Also, I’ve been playing Space Marine on my Xbox lately and that has caused a resurgence in my feelings towards humanity’s finest, even though long-suffering alien love Gribblin may have even more T4 3+ saves in his future. I know he’s a big fan of the Dark Angels too. So it is that as much as I try to leave behind the universe that first swept away my childish imagination I seem forever lost in the warp, damned to forever circle around the vortex of 40k as it eddies and whirls its way through time. And while I might have to cry myself to sleep at night for succumbing to the fanboy’s favourites at least I can console myself with the thought that, for once, the boxed sets are actually a good deal for how much you get in them. As Servitob said in his last post, he and I had a little get together Friday night and fought our first battle of the newest edition of 40k, and I thought I’d share a few of my impressions of the game. I case you are really new to this blog site or have not been paying attention over the past couple of years I am an avid Tyranid fan. It was the first wargaming army I ever collected and after almost two decades of gaming (is it really that long?!) I have amassed a collection in excess of 10,000 points, and as you’ve probably guessed I wanted to give a Tyranid approach to the new rules. The game we played was a small one, just 1000 points a side. There were several new elements to the game that we forgot about (like Warlord powers) and others that we chose not to use; such as Mysterious Terrain & Objectives. We just wanted to see how the core set worked out. Movement hasn’t really changed, though Fleet is good for re-rolling your move-through-cover & charges (as my Harpy found out), but as I wasn’t using my Raveners I couldn’t give you a perspective on those. Flying Monstrous Creatures are awesome!!!!!! The option of glide or swoop is fantastic. I’d thought about including a Harpy as a regular in my nid list for a while, but now a wing beastie will be a standard. The Vectored Assault they can perform whilst Swooping (basically you cause D3+1 AP3 hits over a unit you fly over) is great against Marines and with a 360 degree fire arc you don’t have to worry about shooting targets. Only being able to hit it on a 6 is great as well, you can get the monster to where you want it to be without worrying too much about it getting shot down. Once your in place (and have Vectored a unit en route) you can glide in the next turn and assault a vehicle if you want. One of the things I was a little uncertain about was monsters not being able to roll 2D6 for armour penetration anymore. All I can say is don’t worry about it. Most monsters are Strength 6 anyway, so you’ll hurt most vehicles on a 4+ and as for Land Raiders, the Smash Attack works just fine (as Servitob’s found out). It just means you’re less likely get any automatic armour penetrations anymore when your big monster squishes the tank. But trust me, they are still more than capable of doing it. Don’t expect too much from the Fear special rule as anything that is Fearless or has And They Shall Know No Fear is immune to it anyway (so that’s pretty much 2/3 of the 40k armies). Servitob made mention of wounds allocation being a significant change. After playing a game I would agree. Rolling all of the armour saves before removing casualties is a major change, especially for Terminators as the ‘throw dice’ at them tactic works better. Removing the closest models as casualties is a pain in close combat as you have to reach in there and remove the models, but in shooting works just fine and makes sense. It does mean that you have to think about where you place those special/heavy weapons armed troops as although your characters get a “Look Out Sir!” roll, they don’t and you could end up losing your tank buster just because you put him in the wrong place. This is a new area in which Jump & Flyer units can excel. If you move to the correct side of a squad and rack up a few wounds on them, then they will have no choice but to remove that special weapon guy as he is the closest. Unfortunately this is the point where I have to say “Oops, I think I might have broken your rules in the first two weeks.” This is regarding wound allocation and multiple wound models that form into units (such as Tyranid Warriors, Raveners and pretty much half the nid army). To explain myself here’s a diagram. 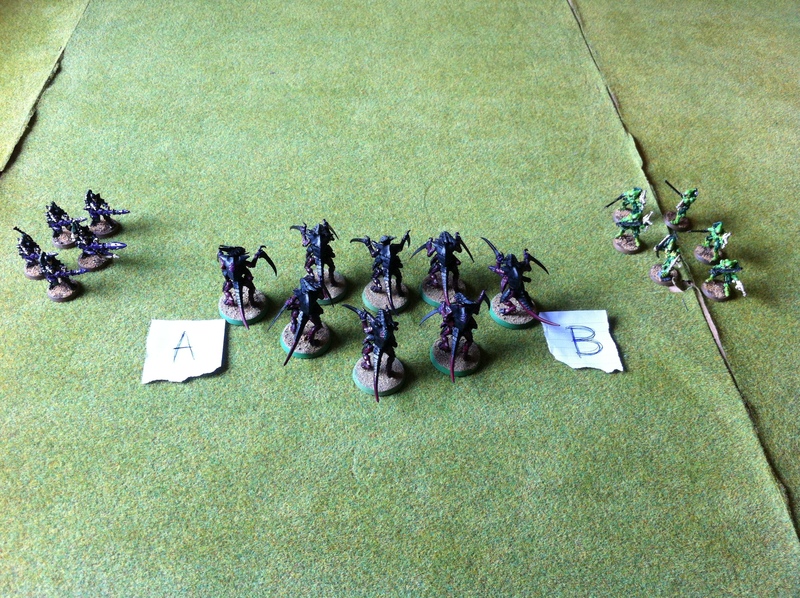 In the above example the Tyranid Warriors are shot at by the Dark Reapers. After rolls to wound etc. the Warrior unit suffers 2 wounds. These must be allocated to the nearest model until he has 0 wounds left. This would be Warrior A. The Scorpions fire on the Warriors and again 2 Wounds are inflicted. These must be allocated to the nearest model – Warrior B. The Warrior unit has therefore taken 4 Wounds, but no one is dead yet…see the problem. It then gets even better. In my next movement phase I choose to re-position the unit so that now Warriors A & B are no longer the closest to the Eldar units. These units then open fire and again causes 2 Wounds each. Again these wounds are allocated to the nearest models which take two each. All of a sudden the Warrior unit has taken 8 Wounds, and yet they’re all still alive…I’ve checked the rule book and gone through the FAQs and found nothing against this. Although there are other armies with units of multiple wound models, this applies more to the Tyranids than any other army. And there is nothing stopping me from re-positioning the models in a unit every movement phase…like I said “Oops”. On a different note, with Fearless not causing excess Wounds when you lose combat, the Termagant Tarpit is back! As an unfortunate Space Marine Captain found out. And Overwatch may seem like a minor change as you can only hit your target on 6s but trust me, when you assault a unit that has a LOT of firepower (such as Deathspitter armed Warriors, each with 3 shots) you roll enough 6s for even a Terminator unit to wince. 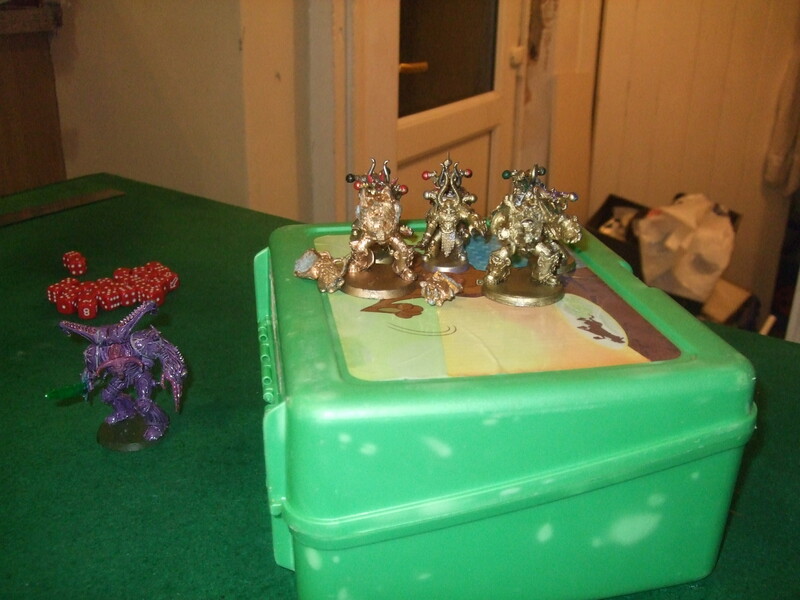 And those are my first impressions regarding the effect on Tyranids in the new 40k edition. Yesterday saw me head over to Gribblin Towers for a chance to try out 40k 6th ed. Gribblin has had the book since launch, and being the studious person he is has read the rules and has a decent idea how things work. Myself on the other hand has the attention span of a newt and therefore generally has to rely on others for the first few years of any system until it gradually sinks in and I can bravely do things on my own. So we lined up our forces in an objective based mission with approximately 1000 points a side. The mighty Space Marines versus the gribbly Tyranids. We rolled for special commander traits and then promptly forgot about them (commander traits seem to be a little bit of extra flavour and in no way game breaking). Turn one begins and we’re off. A few minor tweaks here and there to movement but nothing significant. A bit of shooting; no huge changes to ingest. Wounds are now taken from the front of the unit seems fair enough and easy enough to take on board. Assaults and charges are now a bit more random, again with wounds coming off the front of the unit. A minor and probably overlooked tweak which could have game altering effects regards wound allocation. In our game four terminators took nine wounds. In fifth edition you would allocate 2 wounds per terminator with one extra for Mr Unlucky. In sixth edition you just roll nine saves, if you fail four the unit is removed. Without boring you with statistics the lifespan of your average terminator unit subjected to lots of shooting or attacks in sixth edition is actually pretty low compared with fifth due to this change; and this applies to any small unit that relies on a good save to keep itself alive. A blazingly obvious change in 6th edition is the introduction of proper rules for flyers. No more tanks ramming aeroplanes out of the sky in this edition! The Tyranids had a flying harpy which caused no end of chaos and destruction. Being very difficult to shoot down I think flyers may well become the new mainstay of many a force. Overall the game was fun and enjoyable. The minor rules tweaking seems to be a bit of an effort to stop people cheesemongering ridiculously win-at-all-costs spiked armies. This will hopefully benefit the tournament community which is who I think the rules were aimed at. From a personal perspective though the flyer rules are a fresh addition otherwise it does seem a bit like change for change’s sake. It seems that a lot of these tweaks add an unecessary extra layer of complexity to an already solid fifth edition without actually making the game more fun or playable. Long term I’ll happily play 6th edition again. However 5th edition works well and is fun to play so I’m puzzled as to why I would want to switch to 6th edition at the moment. 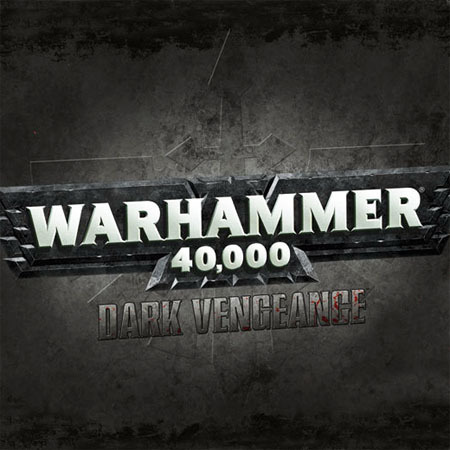 As I drove home from my latest game of 40k on Friday night, the local radio station was just getting to the end of the countdown of what they described as the heaviest albums of all time. Immediately my dad’s 1970’s super deluxe vinyl edition of Jeff Wayne’s War of The Worlds sprang to mind. I remember it being a massive slab of cardboard and vinyl, with a whole array of discs, artwork and other very dense inserts. It was a hefty album indeed, but apparently not as heavy as the winner of the countdown which must have been sold in a concrete CD case with a steel ball and chain security tag. Anyway, the winner was ‘Raining Blood’ by Slayer. Now I like my metal as much as any other headbanger, but not to the Slayer end of the spectrum. I actually met Napalm Death in a bar once and completely did not get excited. Back to the story; the track the DJ decided to play off the previously mentioned supermassive album was called ‘Angel of Death’, an entirely suitable choice to end the evening! The battle was myself versus J; an epic face off between the might of Vulkan He’Stan and his rampaging hordes of master-crafted-thunder-hammering-assault-terminator Space Marines and the power of their dark brothers, a spiky mob of Slaaneshy-Daemon-Princey-Lash-whipping-plasma-cannoning-and-more-plasma-gunning Chaos Space Marines. We lacked terrain, and in the end used J’s homemade bastion and other bits and pieces picked up in the kitchen, including a Scooby-Doo lunchbox, which was to become the focus of brutal slaughter. The game was table quarters, seize ground with three objectives, including the bastion and lunchbox. Early on in the game Chaos had parked itself on two objectives, with a combat squad of Salamander loyalists holding the third. A Chaos Land Raider stuffed with khorne beserkers soon ejected the loyalists, allowing Chaos to grasp all objectives by mid-game. The loyalists attacking the bastion had become bogged down in heavy terrain, with their heavy support Vindicator throwing a track early on. The loyalists attempting to seize the lunchbox were taking withering fire from obliterators and plague marines on the objective and were making little progress. Meanwhile, Vulkan He’Stan and his hammertime posse had driven their Crusader deep into the enemies back field and were busy mullering anything not on an objective, but having little impact on the game outcome. Whilst they were busy splattering non-scoring units, their Crusader returned to annihilate the khorne beserkers and destroy their Land Raider transport in a turn of furious firepower, leaving the objective vacant. At this point the loyalists slowly trudging through rubble towards the bastion decided to abandon their prospects of ever capturing it this century and split up, a Space Marine combat squad heading to capture the now vacant third objective, and a squad of assault terminators heading off to mash a daemon prince who happened to fly by too close. 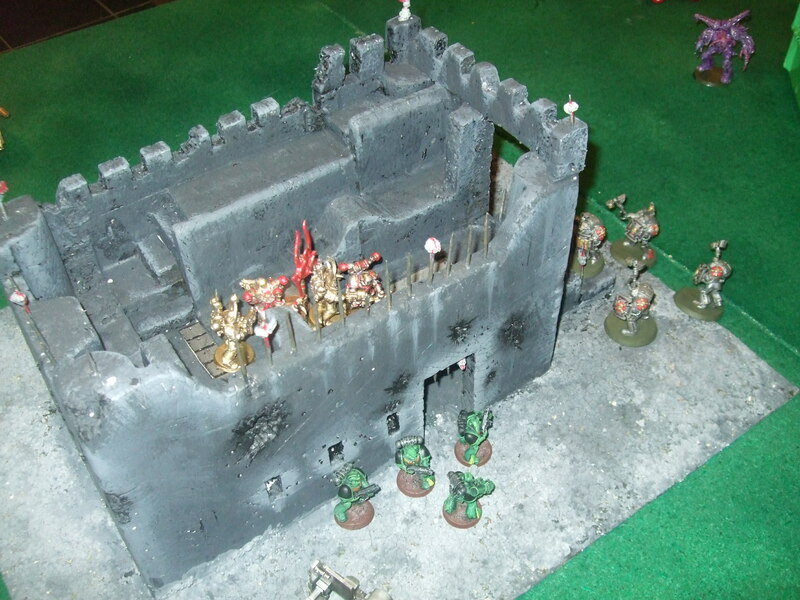 By turn six Chaos still held the lunchbox and bastion, and loyalists were still struggling through the rubble to reach the third vacant objective. The last desperate gamble of turn six had been a final assault by a loyalist combat squad on the lunchbox in an attempt to remove its final defender, an aspiring plague marine champion with power fist. The assault failed as the single champion beat down all of the attackers. It looked set for a two to nothing victory for chaos until J rolled for end of game. Unluckily for him it went to turn seven. By this time Vulkan had been picked up by his Crusader and was busy speeding towards a final decisive battle atop the lunchbox. A final loyalist combat squad who had been walking to the box since their transport got destroyed in turn four finally arrived. The other squad who had done nothing all game other than struggle through rubble finally made a run for the uncontested objective, only just making it in turn seven. Vulkan scaled the lunchbox, and the final assault went in against the lone aspiring champion who up until this point had been winning the game. Vulkan had to employ both his master crafted relic blade and digital weapons to shift the stubborn defender, which allowed his supporting combat squad to seize the objective. In conclusion, it was an extremely close game. The loyalists won 2-1 in the end, but only after being behind 2-0 at the end of turn six. The most effective units on each side were probably the loyalist’s Crusader, which survived the entire game playing a key role in the capture of two objectives, and Chaos’s Obliterators, who from turn one proved to be a menace and slowed any hopes of a swift loyalist advance and victory. It was an enjoyable game, and showed the nail-biting tension a decent game of Warhammer 40k can bring. I find it a shame that the Sheriff is intent upon changing this great ruleset for something else in the next edition, probably to the benefit of no-one except shareholders. It just makes me hope that rather than going for codex creep, GW can actually concentrate on gameplay, good models, good balance and good fun rather than the need to release ever more all-conquering all-powerful armies. It is an interesting coincidence that this game was played on the day that Warpath released. If all games of 40k were this fun then Warpath wouldn’t stand a cat’s chance at a cacodaemon’s barbeque of being successful. When it comes to flogging successful product lines the Sheriff seems to always do pretty well in the video game market. Well games based on their intellectual properties at least; I don’t think there’s a snotling computer lab somewhere in Nottingham churning out software. Little plastic men? Pffft… digital bloodshed is where the real money’s at nowadays. Make a nice little shooty pew pew game and the fans will come flocking to the stores to pick up battalion boxsets. Unfortunately, personal experience shows that that might not happen. 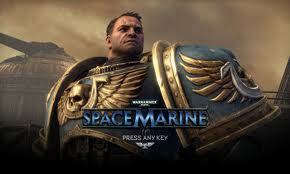 Space Marine, the Xbox 360 game has been hotly anticipated by the more mobile-thumbed of the crew for quite some time. Was it worth the wait? Hell yes! Step into the almighty blue armour of Captain Titus and slaughter your way across a planet in what I describe as one of the most violent video games I’ve ever seen. Gone are the wussy auto health regenerations of the COD generation, here is a game which forces you to physically pull limbs off, eviscerate and decapitate your opponents in sprays of violent gore in order to keep going. All in very good looking, suitably gothic and appropriate surrounds. Are there any downsides? Well of course. The usual bunch of twelve year old Russians will still own you in competitive multiplayer, but rumour has it that soon cooperative multiplayer will be available. Flufftards are also going to hate it because its about the blue GW poster boys, rather some more deserving chapter, and the main character Captain Titus isn’t actually listed in the Ultramarines order of battle. Personally I wouldn’t have cared if it were about Captain Flower Applejack of the Rainbow Warriors. Anyway, if you want a real review rather than my random thoughts go check a real review site. I certainly like this game. Will it influence sales of little plastic men? Well since getting this game I haven’t touched a single figure!